This last week has been productive for the White Helmets, having expanded their their studio lot from Idlib, down to terrorist-occupied suburb of East Ghouta, Damascus, with both sites running the exact same story-boarded scenes and production values. It’s become all-too predictable: the same scripting and camera shots, all feeding into the same western mainstream media treatment of a made-to-order ‘civil war’ narrative, designed to elicit an emotional response from western viewers and to further reinforce the western humanitarian crisis mythology, in the hope of engineering a western imperative to escalate its intervention against the Syrian government. This latest report released by Reuters/NBC News contains some incredibly misleading propaganda, with the headline, “Russia intensifies bombing of Syria’s Idlib after rebels down jet, killing pilot,” making this alleged incident seem like wanton revenge on the part of the evil Russians. Notice how Reuters/NBC News try and tart-up their report by citing “Civil defense sources”, which might sound impressive to anyone who hasn’t actually been following this conflict closely for the past 7 years. What Reuters/NBC News have conveniently left out is the fact the ‘civil defense’ organization they are referring to is none other the White Helmets, and who are al Qaeda’s civil defense, operating exclusively in ‘rebel’ terrorist-occupied areas in Syria. Their base of operations is in Turkey, not Syria, and they are being funded by UK, US and EU member state governments to the tune of over $200 million since their inception in late 2013. None of these facts are ever mentioned in any western mainstream coverage of this pseudo NGO’s exploits. What’s interesting about this Reuters/NBC News mainstream written report is that for the first time, the MSM have failed to even mention the name “White Helmets”, opting instead for the more official sounding ‘Civil Defense’. One reason for this could be that the White Helmets brand is so tarnish by now, that even mentioning them might be a liability for western media outlets who are still determined to air their propaganda videos during newscasts. What NBC News, nor any other western media fail to mention is that the White Helmets are in fact a rip-off of the REAL Syrian Civil Defense who are an official state civil organisation and members of the ICDO based in Geneva, and who have been working all over the country throughout the Syrian War. What Reuters will never mention is how terrorists groups in Syria (with whom the White Helmets are an adjunct) have a record of intentionally occupying hospitals and schools for their base of operations, for obvious strategic reasons – a fact known to anyone who has reported in Syria, but ignored by the western media. The sectarian narrative is useful for western audiences who are generally bedazzled by complex regional proxy wars, and will normally latch-on to an easy, out-of-the-box neocolonial binary narrative, like Sunni vs. Shi’ite (Shia), and where the US, UK, Saudi Arabia, Israel will be opposing the Shi’ite factions while backing the Sunni militant factions who are meant to categorically oppose enemies Syria, Russia, Iran and Hezbollah. What they fail to mention is that TERRORISTS and their families have been flooding into Idlib over the last two years, which has come under the de facto control of al Qaeda affiliate Hayat Tahrir al-Sham (HTS) aka the Liberation of the Levant Organisation, which is effectively a re-branding of Jabat al Nusra (al Qaeda in Syria), making Syria’s Idlib province a second “Islamic State” – only this Islamic State is being openly favoured by the US, UK, Turkey, Saudi Arabia and the rest of the anti-Syria axis block. The Reuters written report ends with the usual scripted call to action to the international community, which could come in the form of a No Fly Zone, or a ‘humanitarian corridor’ – which in the past have been used by the US and NATO member states as a rat-line to re-supply terrorist groups. Last week, we saw more impressive videos produced by the White Helmets, depicting a “chemical attack” in East Ghouta – claiming that the Syrian Government, commonly referred to as the “Assad regime”, dropped ‘chlorine bombs’ on civilians there. Whatever this is – a completely staged video, or worse – using civilians as guinea pigs in some makeshift chemical event, this video it smacks of the same theatrics, only this time the group seem to have acquired some new professional-looking props, like foam spray guns, although still reliant the vintage garden hose to spray its victims for its ‘decontamination’ shot. 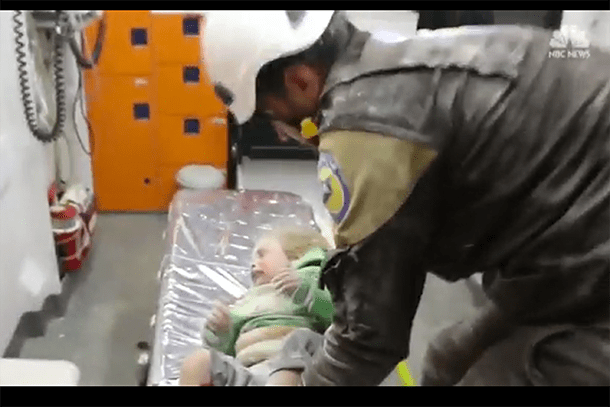 White Helmets can also be seen gently rubbing the male victims on their backs, while wearing paper surgeons masks alongside others helpers who aren’t wearing any masks – and while none of the victims are really exhibiting any real symptoms of a chlorine gas attack. Granted, maybe they didn’t rehearse enough for this sketch, or is wasn’t covered during White Helmet founder James Le Mesurier’s advanced ‘civil defense’ course at their training and film academy set located in Gaziantep, Turkey. With Syria all but having won the war, and with most areas in the country liberated from terrorist occupiers, the Western media outlets still hope they can reverse their faltering ‘regime change’ fortunes by continuing to circulate White Helmet videos claiming that Assad is somehow acting-out a bizarre national death wish by launching chemical weapons at civilians. It’s utterly ridiculous. Luckily this time, no dead children were used as props, as we’ve seen before in similar interventionist propaganda productions in the past. No matter how many video productions they feed CNN, NBC and the other western media outlets on their PR distribution list – it will not change the fact that the White Helmets are a fraudulent construct and terrorist affiliates – and this fraud is being repeated used in order to sell increased intervention and the current illegal military occupation of Syria by the US.